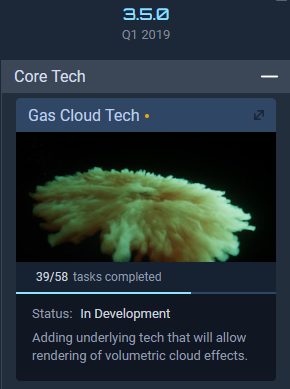 Gas cloud tech was shown at CitizenCon 2017, then it was on the roadmap for 3.3, then postponed to 3.4, then to 3.6 , now its just gone. Do they plan to release Microtech without snow and clouds ? Can we have more communication on this subject ? I’m currently working on gascloud tech, though to be clear this is just the underlying tech side of it – we’re using it for Sq42 (obviously), it doesn’t cover any particular usage of it in the PU (though we do intend to use it), and it’s not intended to be used for weather or planetary clouds (so anything to do with them isn’t affected by its schedule).